I've been getting a lot of enquiries about New York Roundabout Again - from all over the world - and figured it must have been posted online somewhere, as often happens. 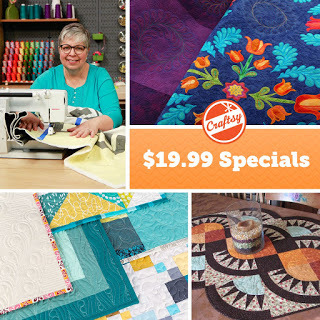 I had no idea where...and then spotted this ad for a sale at Craftsy. In the lower right hand corner is New York Roundabout Again made by Jeannine Damstetter of MA. 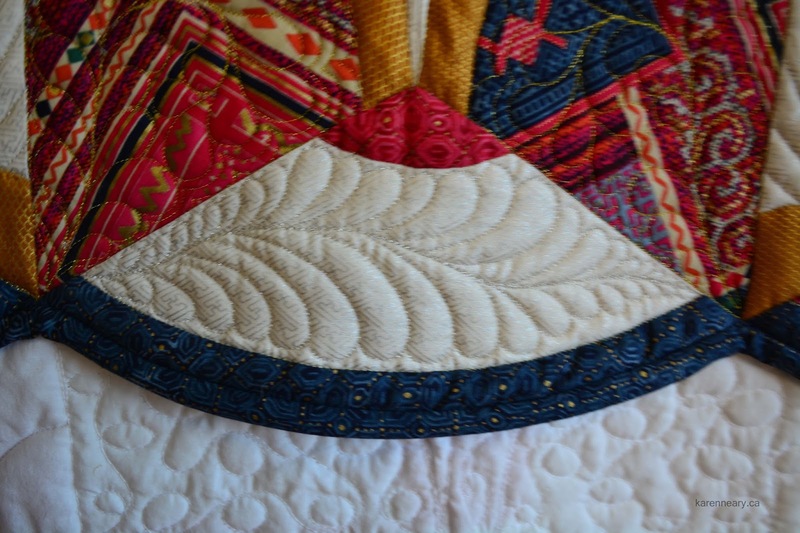 The pattern is not available on Craftsy, nor is it part of a class, but Jeannine took a feather quilting class through Craftsy and used her new skills on her Roundabout quilt. 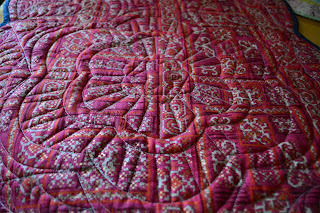 It turned out beautifully and has gotten a lot of well-deserved attention. 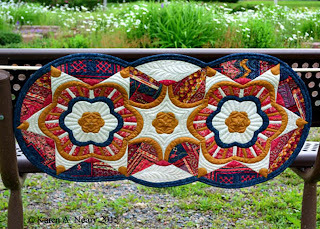 You can find the pattern for New York Roundabout Again on my website. 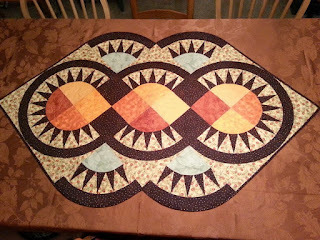 Debbie Ferguson from Kingsville, Ontario sent along a picture of her version of Arabesque from the book Quilting Beauties. It's a stunner! 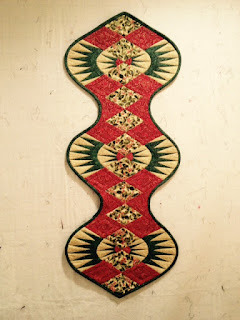 Debbie chose Christmas prints and will use this as a runner during the holidays. I confess I absolutely love the curved shape of this piece. Debbie liked having the foundations on a CD and she is intending to make more projects from the book.We look forward to seeing what's next, Debbie! Thank you for sharing. 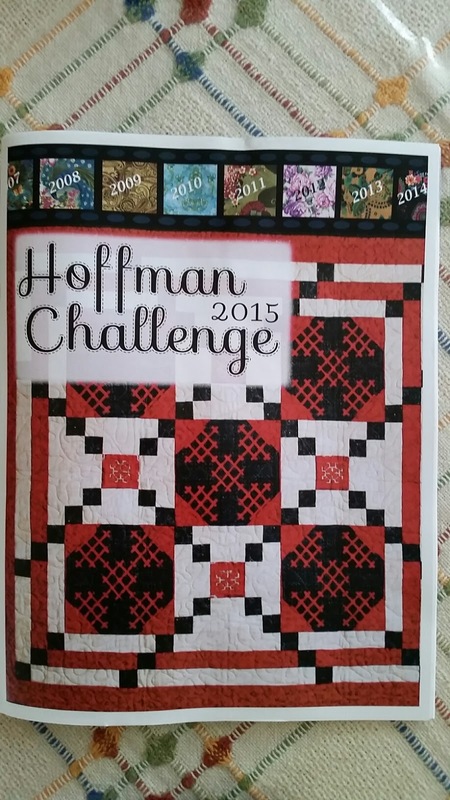 I was shocked to find this in my mailbox today - the catalogue of "honourees" for the 2015 Hoffman Challenge. So soon!! Melissa Ratzlaff, who curated the challenge, did a stellar job of getting the catalogue together and printed so quickly. I expect she burned through a lot of midnight oil. It's very cool to see my name there, and also "Amherst, N.S. 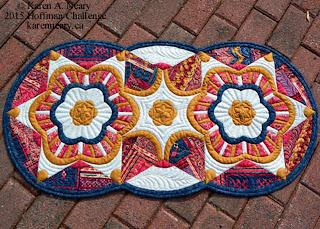 ", BUT...what you don't see...is that of only 5 Canadian quilts chosen to travel with the show, at least 2 (and possibly 3) of the makers purchased their challenge fabrics at Mrs. Pugsley's Emporium, Amherst's local quilt shop. That's pretty mind-boggling and shows what a presence Mrs. P. has established...right here in little ol' Amherst. 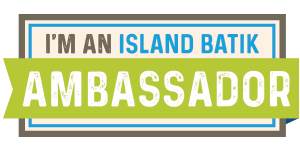 I am grateful (and excited!) when others see my work someplace, and email to let me know. 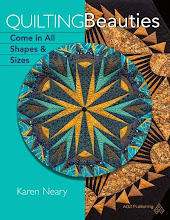 Jeanne Kaye from Fredericton was sweet to be in touch to say she had spotted my book Quilting Beauties at the City Quilter in New York. 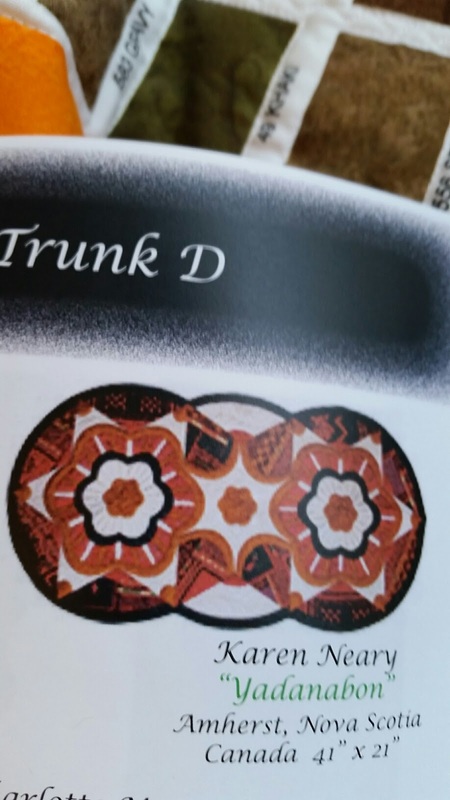 Previously, Mrs. Pugsley had discovered this shop selling kits for my New York Roundabout. Very cool to have a presence in this awesome, big-city, shop. 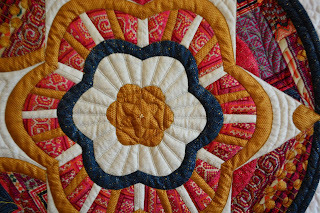 Kate from Kanata kindly sent along a couple of pictures from the recent AQS Quilt Week show in Syracuse, N.Y. 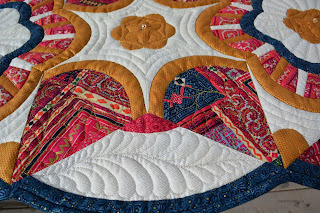 This shows Tempus Fugit (from Quilting Beauties) in the Author's Booth. 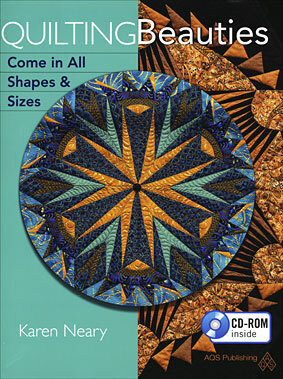 Interestingly enough, Kate had previously seen this quilt one year at Quilt Canada. Here is the rack of books as you enter the display area, and Kate tells me she had to shoo a few people out of the way so that she could get this picture for me. I appreciate your efforts, Kate - thank you! Lots of you really seem to enjoy hearing about the honeybees so I thought I would share something which has impressed the heck out of us. 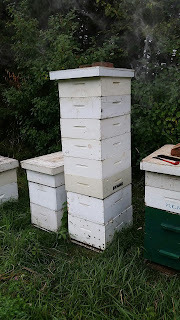 I've mentioned that the bees have struggled through our last two very long and difficult winters. They got off to a shaky start this spring as the season was so late arriving, but they have done an incredible job getting themselves back on track. Even in this wicked hot and humid weather we've been having the past couple of weeks, the bees have been industriously making honey. 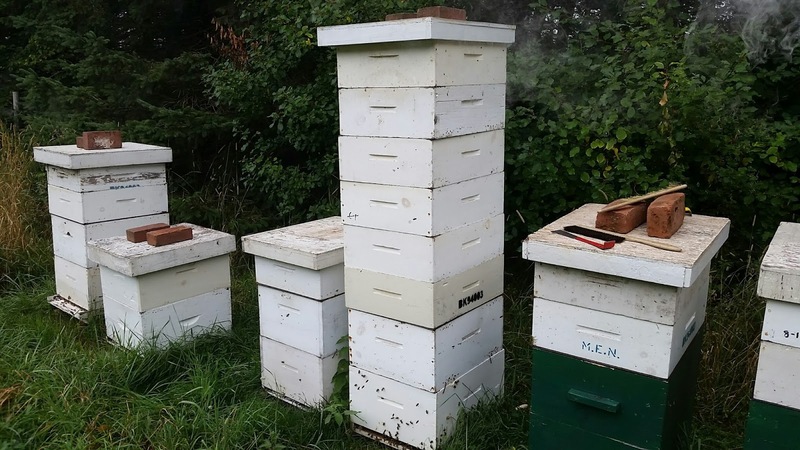 We keep a close eye on their progress and add honey supers as needed. Yesterday we added a SIXTH honey super to this one hive, giving it the distinction of having the most supers EVER since hubby started beekeeping, about 20 years ago. His previous record was 5. You can see how much ahead it is, compared to the other hives. Some others have 3 honey supers on, which is a good effort. But 6 - wow! The season is almost over, as usually we take the honey off by the end of August. It's probably a good thing there isn't more time...or hubby might need a ladder to harvest the crop! 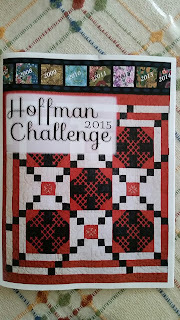 As far back as I can remember, I have longed to part of the Hoffman Challenge. 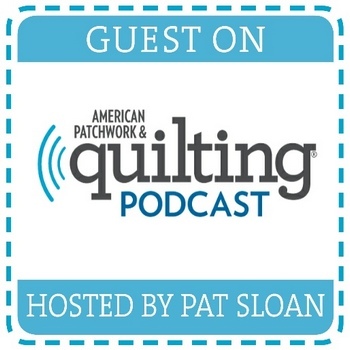 I see this prestigious show as a badge of honour (in fact, they term the travelling quilts "honourees".) 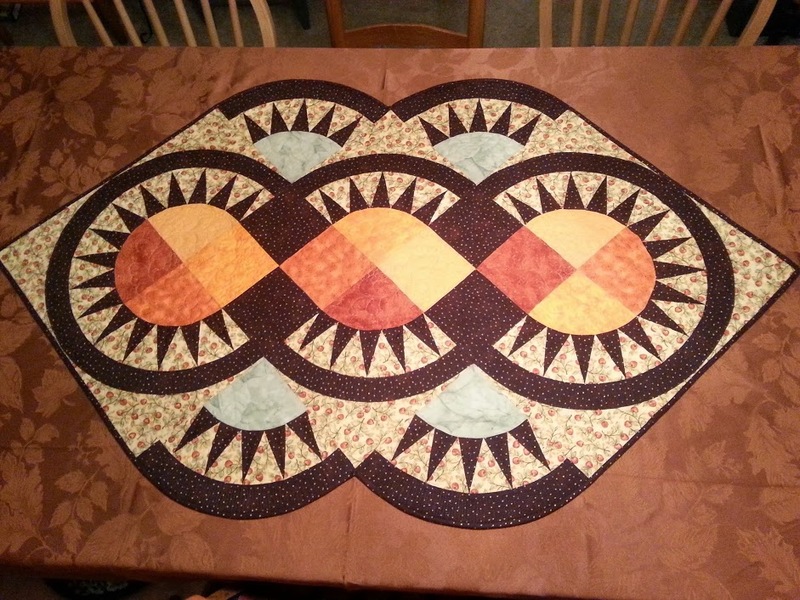 Each year when redoing my list of quilting goals, that one would get transferred onto the new page. 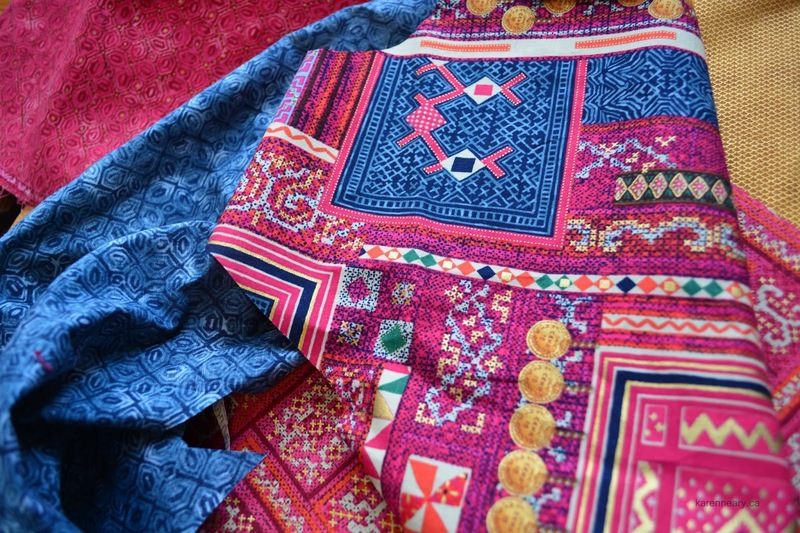 Imagine my delight last fall, when Mrs. Pugsley announced she was ordering in the challenge fabric, providing a rare opportunity to see, feel, and dream the fabric in person. This year's collection was called Mandalay, and my design came from there - white spires; precious gold, silver, and gems; mandalas. 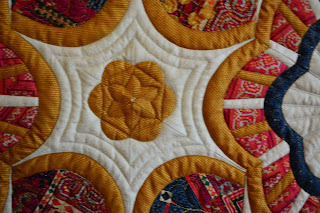 Because my mind was filled with New York Beautys at the time, that's how I saw the translation from fabric to quilt. I added two other Hoffman fabrics to the mix - a sparkly gold, and a cream laced with metallic silver threads. Part of the Challenge was to use Aurifil threads, which I did...and totally fell in love with this thread. 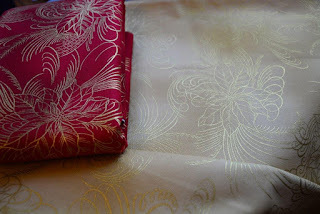 I used gold and silver metallic, a 40 weight cotton in a gorgeous ruby shade, and a very subtle 50 weight grey/white variegated which worked beautifully with the cream and silver fabric. This block arrangement shows the gold-tipped white spires surrounding a mandala. 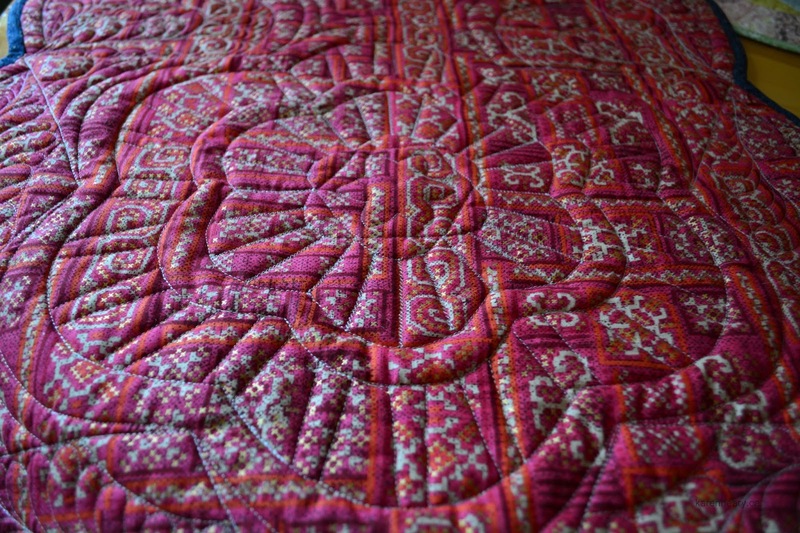 I kept the quilting simple; the fabric and quilt were busy enough. My Artist Statement reads: Mandalay: city of white spires, circular plains, and opulent riches. All of these are reflected in the patchwork, with NY Beauty blocks forming the mandalas, quilting with gold, silver and ruby threads, and small "gems" in the form of Swarovski crystals. The original name for this Royal city was Yadanabon, meaning "city of gems". 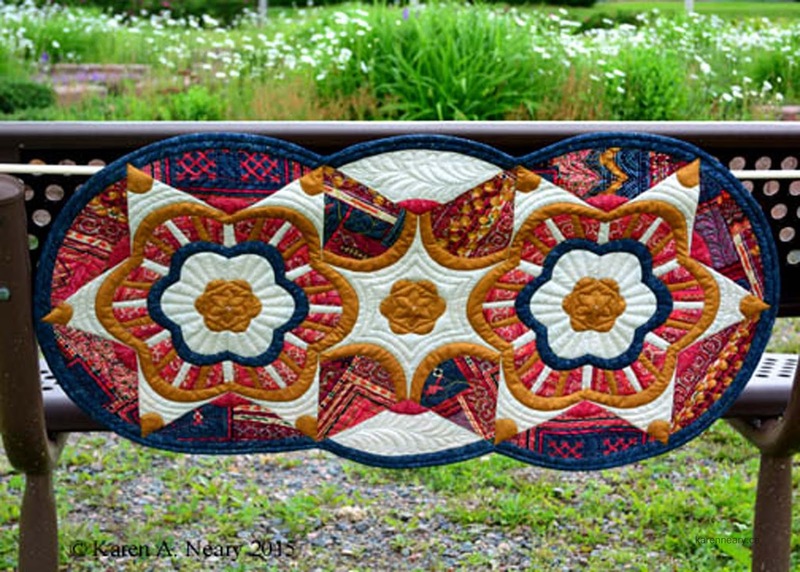 It was exciting to have my quilt chosen to travel, and see "Amherst, Nova Scotia" listed in the home addresses. The entries are split up into several smaller travelling units and they will spend the year travelling to various venues across the U.S. This weekend is the grand opening show at the Rocky Mountain Quilt Festival in Loveland, Colorado where the challenge quilts will be exhibited in their entirety - the only place you will see them all together. This is a big one off my Bucket List, and I am honoured to be part of this show. 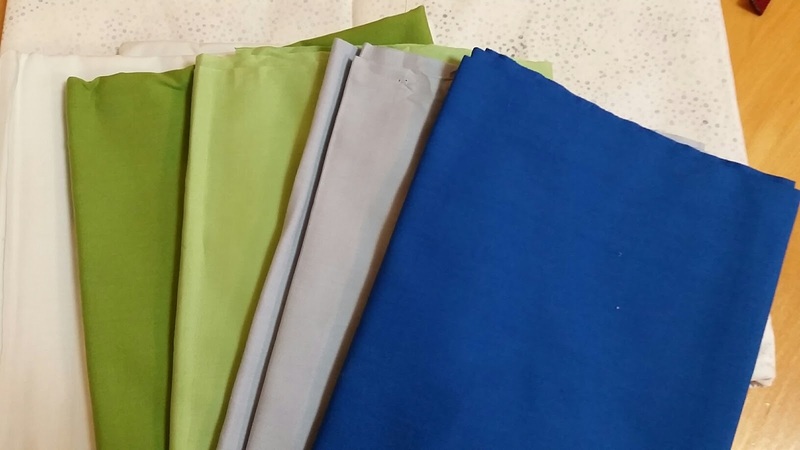 Thanks Mrs. Pugsley for bringing these fabrics to Amherst! More new fabric! Zinc, Leaf, Pistachio, Arctic Blue and Cobalt Hoffman Indah Solids - loving this combination, The Zinc is a cool (greyish) white - a perfect background for my chosen threads. These are Aurifil 12 and 28 weights which will be used for the quilting. 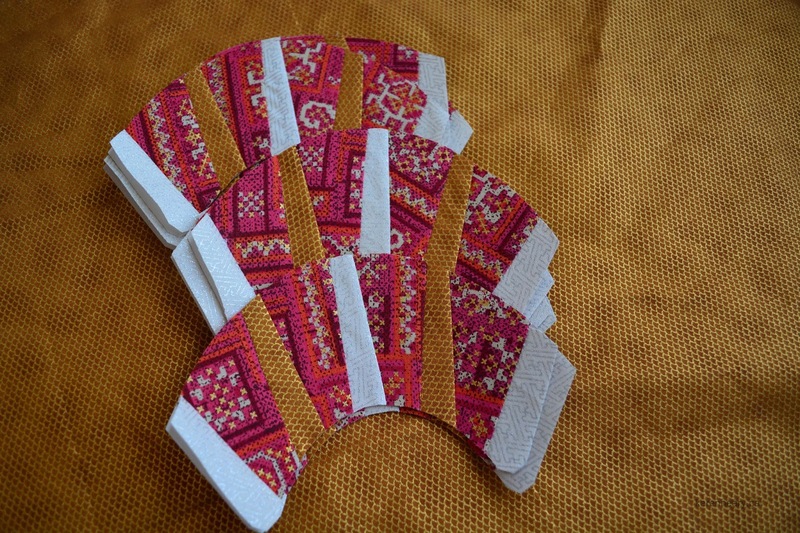 Off to sew! 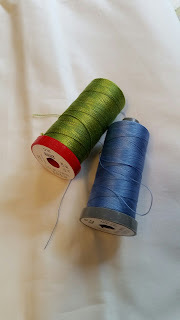 The checkout is uploaded and working on my website for Aurifil thread...with one little hitch. (There's always a hitch!) 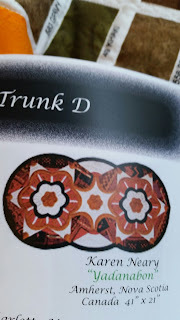 It isn't possible to have the postage stay in line with the quantity added so it adds postage with each spool ordered. Please don't panic - this will be adjusted and refunded to you at once! 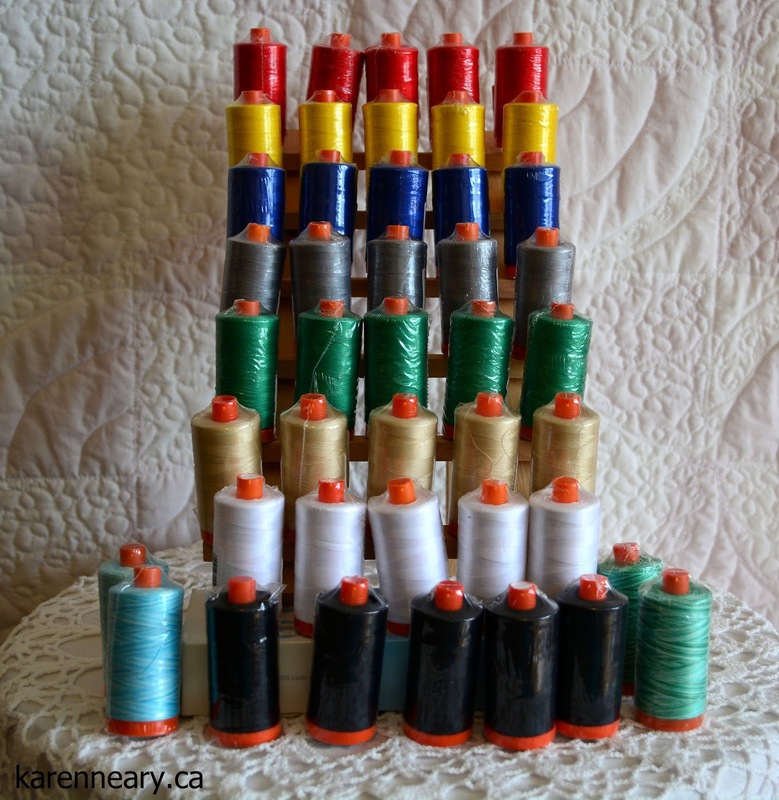 Thread is light but bulky, so it costs no more to mail 5 spools than it does one. More colours and weights will be added soon! Saturday shopping errands included a visit to Mrs. Pugsley's Emporium. 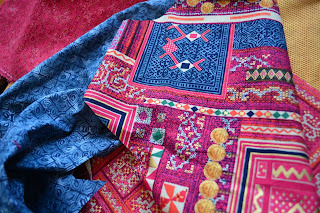 I knew she had new fabrics in and I needed to see them - fun things, like work boots and skis, and gorgeous things, like more Hoffman. 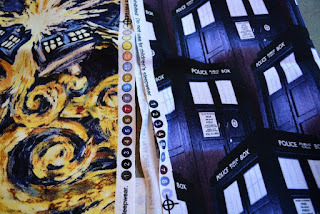 I knew my niece would love these Dr Who prints, featuring the tardis. 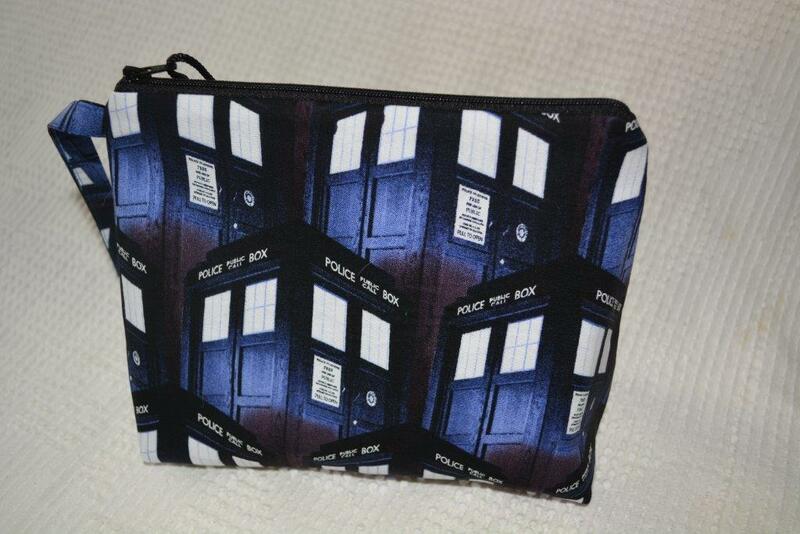 I bought a Fat Quarter of each print and made her a zippered pouch. They are fun to do and only take a few minutes to sew. 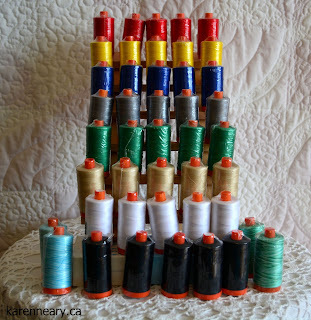 Before Christmas, I bought a pile of zippers at Mrs. P's; it's so handy to have the right colour on hand. 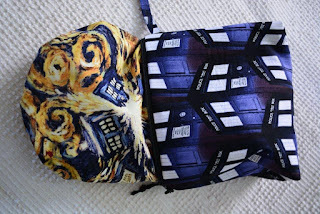 The "exploding tardis" print was used for the lining. She will love this, and hopefully can find a use. I also picked up 4 more metres from Hoffman's "Berries and Blooms" collection because I can't stop thinking about this fabric and decided I hadn't bought enough the first time I saw it. (Why are the words "obsessed" and "hoarder" running through my brain...?) If you click on the photo you can see how luscious the gold is on that cream. The best part of the visit was a chance meeting with Lucy, a quilter from Fredericton whom I met at a workshop I gave in Keswick Ridge several years ago. Wonderful to see you Lucy and to have a little catch-up. The timing was perfect - what are the odds that we would be there at the same time?! 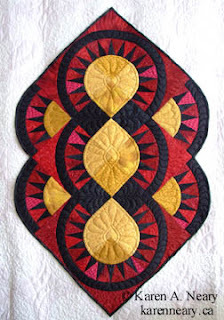 I am off to iron my Berries and Blooms fabrics and dream of what they will become. They seem to be whispering "diamonds...cut me into diamonds..."